The author wearing pink low chucks by Lake Erie. The story of our lives is written by our every day actions. Little do people realize — no matter how much alike we are as a people — our lives are always lived out completely different from one another. We do our everyday actions in our own ways, once we have become of age. But from the day we are created until we become teenagers and young adults, our parents write our lives out for us. They decide what we will do, and what we will accomplish; they are forming us into what they believe is right. One day, we all reach a point where we do not have someone to tell us what to do. It is like going from being a robot, to receiving the right to make your own decisions. We’ve become someone, but not quite ourselves — until that day. We know who we are, to a very small degree. Almost every child I have ever met wanted to either have a houseful of pets and live on a farm, or they wanted to drive construction equipment. Some will say they wanted to be the ruler of some great land. As if there were another great land to conquer, for them to leave their mark in history. Some children want to leave a greater mark than others in history, but everyone leaves their own mark in some form or fashion. As we grow up and grow older, we begin to form our own ideas. Those of us who had decided they’d never wanted a family eventually find someone special that they can not possibly imagine living life without. Other times, the decisions they’d made when they were children are held in their hearts all the way through their lives, and accomplish what they saw would be a great thing to succeed at. I am not an adult yet; I am only seventeen years old. I’m only now beginning to form my own decisions, some of which I am allowed to carry out. I am at the stage where I’m tugging at the ropes — nearly breaking my way free. It is almost like a young, wild horse caught under a cowboy’s ropes. When I break free I will be on my own, forming my own decisions and seeking my own horizons. 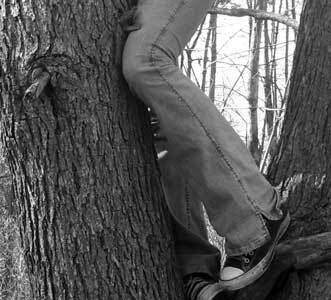 They may lead me far, or they may be the horizons that are only past the trees that currently hinder my view. I do not know where I will go, but I do know where I have gone so far. I have walked many of the roads, and have seen many of the sights. The roads and the sights of my life will fade to a small extent. The things that reigned prevalently amazing in my heart, someday will not seem so great. The sorrows that wept in my heart will someday heal and not be so sad. The things that seemed so strange to me will probably become very familiar and almost comforting to think about — when I find myself in a new, unfamiliar place. I feel that though we can not hold the things of the past in our hearts and in our hands, we can always carry something familiar with us. Some children keep their favorite teddy bear, secured in a box with a small lock. Some people keep that picture of their long-lost loved one on their dresser, neatly framed. Some people keep a tiny, wooden box with a love letter in it from someone they’d fallen in love with long ago. When their eyes settle upon these things it feels so special, so important to them. The things they’ve come to are not so scary, not so unfamiliar, because a piece of who they were is still with them. I do not have any of these things. I had never grown close to a special stuffed animal; I do not have a picture to hold of my dear loved ones. I have something that I do not feel that many see quite in the same way that I do. My shoes. My shoes are quite an ordinary pair of Converse shoes. They have off-white laces, stained and tattered from years of being worn. The places in which they’ve scuffed the ground they have worn out. Perhaps they’ve worn to the point that their rubber soles no longer exist in certain places. The places in which my shoes bend have formed worn-out lines, and they have faded from the many sunsets that they’ve bathed in. The only thing different about these very ordinary high-top shoes, are my laces. I have taken pop can tabs and laced my laces through them. To me it gives a very cool, artsy look. It makes them look unique, and it is something I’ve never seen done before. The pop tabs have personalized them to my liking. My other two pairs of Converse shoes each have had their own set of unique laces as well. My first pair had one red lace, and the other lace was changed several times. My second pair had orange and green laces. 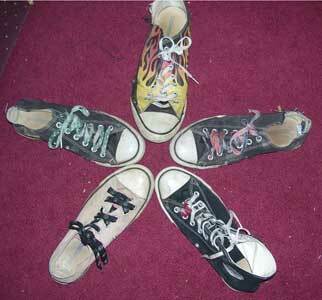 Briana’s three pairs of chucks. To recall the many places I’ve worn my shoes would be like remembering the day you decided you liked pizza. I am not sure I can remember all the places I’ve worn them, for they’ve been on my feet for so long. My family travels frequently, and my shoes accompany me. When I am in unfamiliar places, alone and forgotten in this great world, I am not so very far away. My shoes accompany me, and never leave me. As I walk the roads of today, they touch down to the road of tomorrow. Sometimes in the dead of winter, when you feel your blood slowly freezing in your veins, you feel as though any place would be better than the void your body occupies. Your eyes gloss over, and you don’t quite see straight. Frozen in time, in this place. A place you do not know, but a place your body inhabits. You’re in this void, a void in a dark place, alone and weary. Pushing on. For what? You don’t quite know or understand, yet, there’s one thing that keeps you from insanity. That little remembrance. That thing — the object that constantly reminds you of your past. Who you were before you became yourself. Who your parents had begun forming you to become. The friends you made, the places you loved, the memories you created. All held dear in the scars of your shoes. These scars are like a tiny mirror reflecting your past in a glimmer of light. A mirror image. You never saw it back then when you first got your shoes — how they could quite possibly become your reminder. Like a diary holding memories dear. Yet, these shoes never said a word to you. They are like your old dog you had as a young child, I think. The way you could look into his eyes, and he could tell you a story. 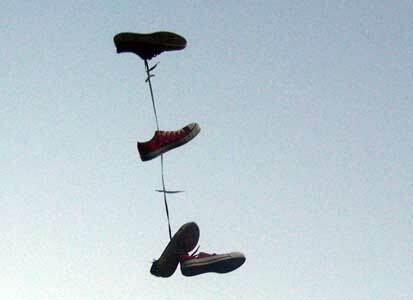 This will happen to you through those worn-out chucks. I do not feel that people often enough realize these things. Not for a while, anyhow. Many people rush through life, never giving a second thought to what they love so much. I feel that these people are blinded by their surroundings, too busy for sentimentality. Too busy for a refuge, something to cleave to. That is until one day. One day they will find that thing, like a mirror image of their lives. It will come to the point where they will be stopped in their tracks, and they will stare forward, realizing all these things that occurred throughout their lives. 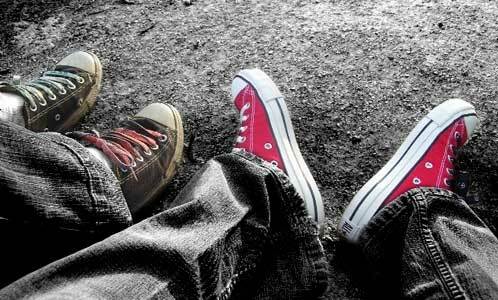 My Converse shoes are the mirror that reflects the memories in my life. In life, we all have friends. Many times though, we go through parts of our stories when we don’t quite have friends. We’ve become invisible to the people around us, in a certain sense. I feel that when a person is in that state, he may walk right past another individual, and never even be noticed. This is when he must find that comfort.... this is where I have found mine. I may only be 17 years old, but I have spent so many days of my life being invisible. I do not know why, but I know that I am. The only people that see you when you’re invisible are the other invisible people. The ones that help you up when you’ve fallen down, the ones who laugh when you smile, and cry when you’re feeling dejected. They make the memories, and they help you scar your shoes, I believe. I have always been a little bit of a rebel, but I did not discover this until I was about 12 years old. This is the time when a child’s life really begins to change in every way imaginable. The day a child can be so awkwardly ugly, and in time become something no one could have dreamed they’d become. On my twelfth birthday I received something that seemed so small, so minimal, but would become something to change my life. They were a pair of low top Converse shoes, bubble gum pink in color. I despised the color pink with all my heart and wished for something a bit more boyish. I was a tomboy. Regardless of this, I was given pink chucks. My Mother spent many years of my life trying to iron out my tomboyish behavior, and perhaps this may have been a way of her getting a small bit of revenge. Much to my surprise, these shoes grew on me more and more. They very quickly became my favorite pair of shoes! I worked with my Dad a lot back then cleaning up the messes on the job, and those shoes were my companions as I would clean up the houses he worked in. The dust and the dirt and the grime engulfed the shoes, fading their color and slowly began to wear them out. It had a nice effect, really. Some shoes look bad after they’re aged and faded and tattered. On the contrary, it looked beautiful on my Converse pair. Shortly after this time, we left on a long, two-week vacation. We headed toward the South, and then toward the West. Two weeks may not seem like a long time, but when they separate you from familiarity, they are quite a long stretch. Especially when you are young and unsure of yourself. 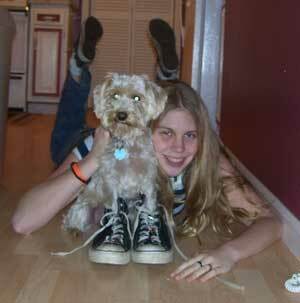 I look back now through pictures, and I cannot find even one picture of me out of those pink shoes. I wore them everywhere we’d go. People frequently seem to frivolously spend money at souvenir shops hoping to remember some place they’d been to. Their homes become over-run, and packed with things like little trinkets and wall hangings, shirts that become old, worn, and outgrown. All those over-priced trinkets that in time break down and become forgotten. My pink chucks served that purpose for me. They walked the places I’d walked, they “saw" the things I’d seen, they accompanied me. As we camped in the hills of Virginia, they walked down those cold, foggy, dark roads. They walked down those busy city streets, the tourist traps. When I was doused in the rain, they too were doused. At any rate, those shoes kissed every road my feet have walked upon. 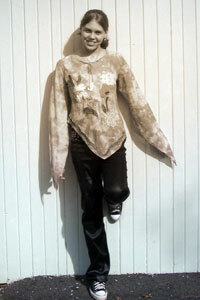 Within time they’d faded and became sun bleached into a worn-out pink look, and sadly, I outgrew them. I’d become a little taller, a little wiser, and a little older. Regardless, I wore them until I received my next pair at the age of 15. This time, they were black -- the color I really admired in chucks. Briana and her brother Jayme at Punderson State Park; staring out the window. The soles were so clean and white just after I received these black low top chucks. In no time at all I was rewarded again with that worn-out look as they took on the scuff marks. The scuff marks were like the frayed edges of a book. The story of your life. The more you fill the story of your life, the older and more worn the book becomes. The more worn out it is, the more you’ve accomplished and the older you’ve become. This is a great accomplishment that not all can say they’ve accomplished. Some people leave their book very neat and orderly, untouched. They steadily go through life with a subtle, calm approach, ambling from spring into fall as their feet gently crunch the leaves. The leaves on the ground are like old pages of our stories, old and browned and crumpled in the past. You see, we may forget stories of our past. The things we thought were down-right hilarious and would be remembered forever are really not. The sadness we felt at one point soon diminishes into a crumpled, browned, old leaf, ready to decay and form a new memory in it’s place. They are never gone, but are just forgotten and recycled. They turn back to dirt, and there grows another tree, supplying more “paper" for our stories to be written upon. The stories that create our lives, and who we are. Where we came from and who we become. So, as your shoes fade and wear out, this is only the continuation of their story. You may not remember how that part of your shoe frayed, but it will always be there, subtly reminding you in some way or another. These shoes traveled upon my feet just as much as the others had. I kept my old pink shoes, locked away somewhere in a box. I took one of the old laces and used them on my new black shoes. I suppose it was some way of taking these old pink shoes along with me — sort of like when a loved one gives you a locket, or something very special, and they pass on. You don’t have them any longer, but you have something they loved, and it’s a reminder of them. Well not only was this lace a reminder of my old shoes, but they kept my new shoe together, as well. My good friend Kellie is into photography, and she had taken the upper left picture of me, standing in front of an old barn where my black chucks gladly crown the picture. The upper right picture shows me walking in a mass of people down some busy road. This was taken close to Christmas, as Kellie and I had gone to see Christmas lights. 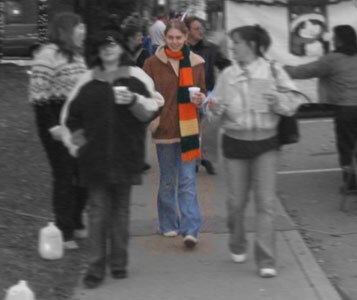 Her mother stands to the right side of the picture, and Kellie stands to my left. Beside Kellie on the left is my good friend Lisy. Once again, I am wearing my Converse on that chilly December evening where I carry a steaming cup of hot chocolate, warming me down to my toes! 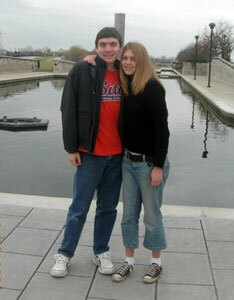 In December 2006 I met my long-distance boyfriend, Dave. He lives in Missouri, and I live in Ohio. We’d talked for nearly a year before we’d finally gotten to meet, and so I have included a picture of him and me in there. 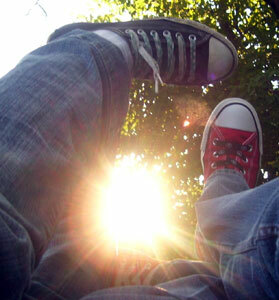 Unfortunately, he hadn’t worn Converse shoes that day, but I had worn mine, and my shoes had made another memory. We’d only been able to be together for a short while, but it was probably the greatest couple hours of my life. I don’t know if anything will ever happen between my boyfriend and me, but my, wouldn’t it be great if someday far from now I could look back and smile as I look at an old photograph from when I’d first met him, and I had been wearing those simple, ordinary pair of chucks? If this ever comes to be so, I know those shoes will sit neatly beside the picture frame, like the key to the story — something very nostalgic. Even if nothing is to happen, I will remember that day with my shoes as being a very warm, happy day — one which I hope to forever remember. That is a memory I do believe I will always hold. Unfortunately, all good things come to an end, and we had to depart to our separate ways... 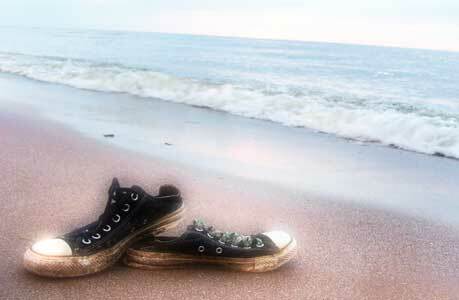 I think that when I do meet up with him again, I will wear those old, black chucks — no matter how tattered they are. It would be like making a memory all over again if I wore those once more... in some form or fashion, it seems like it could be a part for one of Disney’s fairy-tale love stories. I wonder sometimes if Chuck Taylor ever could realize the impact Converse Shoes would leave on the world. I doubt he ever did actually realize that someday, many years down the road, kids would still be wearing these shoes, people would still be making memories, and even that these shoes would make it into movies and commercials and magazines as well. That someday a young girl would meet her boyfriend in those shoes, and that it would mean the world to her. Why? Because sometime long ago, her parents had met and worn Converse shoes in a photograph quite similar to that one she’d taken. Perhaps there was even a photograph of her grandparents in Converse shoes, too. People sometimes think that these are just shoes... just another style to cover your feet... to keep them protected from the elements around us. Quite the contrary. Converse are not just shoes... not just a fashion statement... they are almost like carrying a history book around. 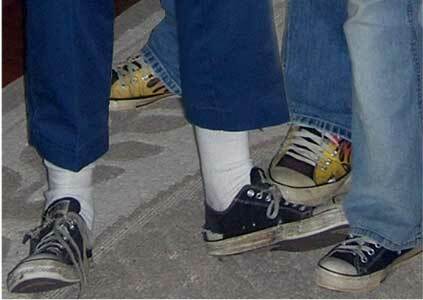 They may not be the very first Converse shoes, but they are like a brother to the first. We are so very lucky to have these shoes crowning our feet. Briana and her friend Halle showing off their chucks. A lot of my fondest memories come from spending time with my best friends. It seems that many of the lasting friendships I’ve made, I’d met those people in my shoes. It was like taking a piece of my past, having it in the present, and making more memories over again. Almost like having a picture on the wall. The picture has it’s own character, but the frame can really add more character to the picture itself. 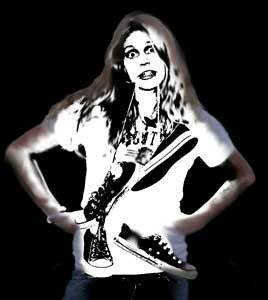 This is what my Converse did — they added that little spice that completely changed the picture. So as I think of the hundreds of memories I’ve made with my friends, I will mark down the ones that reign fondest to me. One memory that sticks out prominently was the time my best friend, Halle, and I had gone to an outdoor concert together. Shortly before, she’d gotten her new, red Converse low-tops We had gone to the concert with her parents, and we decided to fool around in the empty, open field, rather then watch the concert. The sun had begun to set on that day, and we were lucky enough to capture a picture of our shoes with the sun blasting through them. To me, that picture was one of those pictures that can tell a story. That picture tells a big story for me. The other picture of us is done in black and white. All that is colored in the picture are our Converse shoes. Her shoes are the red, and mine are the black ones. During that day, Halle and I had tied our shoes together, and we spent several tries on getting the perfect shot of our shoes “falling from the sky”. We got the photo all right... but we also got very tightly-knotted-together shoes too! We were really struggling to get them undone. And then Halle’s parents said we were leaving! So, we ended up walking to the car without shoes. I’ve included a very abstract picture of how these shoes were knotted together as they hung down about my neck. On the way home, we tried harder to get the shoelaces apart, but it was a useless hope — especially when we arrived at Starbucks Coffee. We quickly unlaced one of each shoe, and stuffed the other shoelace (which was still knotted tightly to the one on our feet) and put them on, walking as best we could with one tied shoe and one that had no lace at all. That was about the craziest experience I had in Converse, and just about the funniest, too. Next in line is a picture taken at my other good friend’s house. Her name is Lisy. It’s quite an ordinary picture, really. Just a black and white photograph of shoes and a tree trunk. But when you really look at it, you can feel this cool, September day. The low sunshine’s on your face, but the breeze keeps you cool. You can feel the texture of the bark against your skin. To me, texture is something else that helps form a memory. Feeling that bark through the soles of my shoes and against my leg will always remind me of that day, and all the fun, great memories I have with Lisy. 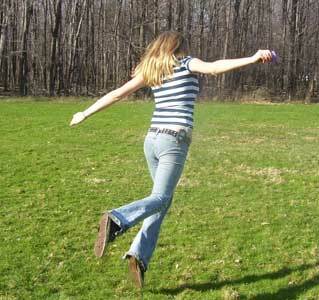 The other picture is of me “frolicking” in the field in her yard. 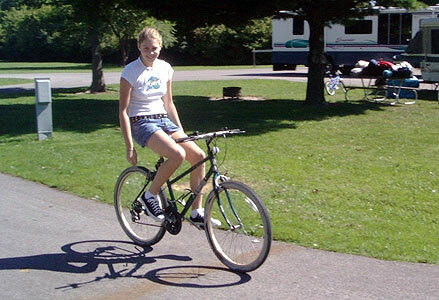 Another great time I had with my shoes was on a big camping trip to Tennessee with my family. This was one of those times where you feel so weird, leaving your home for several weeks, not quite sure where you’re going or where you’ll stay or whom you’ll meet. You feel as though you’re leaving the world behind, buckling your seatbelt for a whole new world of adventure, sights, smells, and places. You feel as if you’re forgetting something, although you have everything and so much more. Cameras, food, clothing - everything really. These are just material items, and really don’t matter. But as you have packed your bag for new horizons — lost in a world that is not your own — you feel your shoes around your feet. Coddling them, almost. And this is a great comfort. You know they’ll always be there and always be with you, and it helps to make those places you go to just that much more familiar. Anyway, Tennessee was an amazing place, and we made a lot of fond memories there. The left picture was taken on our way down to Tennessee. It was taken at a park called The Kentucky Horse Park. It’s one of those pictures that describes something... something you can’t really put into words. The gentleness, yet wildness of the horses’ hooves, and then the Converse shoes... really just indescribable I also enjoy this picture, because I have a great love for horses, myself. 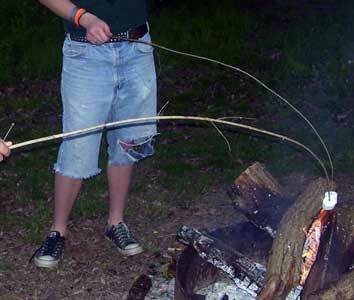 One of my favorite parts of camping is the campfire. I have spent many nights by the fire, where all you hear are the stars singing their whispered songs. Where the trees dance and sway, and the tall grass lonely cries out in the wind. The fire keeps you warm and cozy. It’s a beautiful feeling that I hope everyone can experience a campfire. The picture on the right is of the campfire and my shoes as I gently roast a marshmallow. 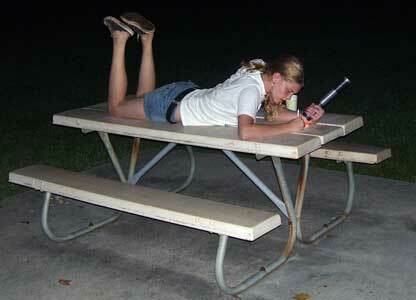 The other picture was taken as I was lying atop the campground’s picnic table one night. At the time being, I was writing my boyfriend a postcard, telling him of all the amazing experiences I’d had on the trip. That night I lay on the picnic table there, watching the stars. Being so far out in the Appalachian Mountains, the freeway lights are not so bright. I have never seen such a beautiful mass of open sky, where the stars are so luminous. That night there was also the start of a meteor shower, and I saw several shooting stars. The picture of me standing on the rock with a glowing outline was taken at Cumberland Falls, just over the border into Kentucky. Although I have spent a large portion of my life being on the road, vacationing and camping, you never quite lose that bit of insecurity The part of you that seeks to find comfort, something you may not always find while on vacation. That feeling of being at home, I guess.... a place you can seek to, escaping from the world around you. One thing I have found though, is that no matter where you go, or how unfamiliar a setting is, there may always be some sense of security. You will meet new people in new places, and there is one thing that may always make us feel at home. That is, the fact that everyone seems to have a certain connection — even if they’ve never set eyes on one another before. 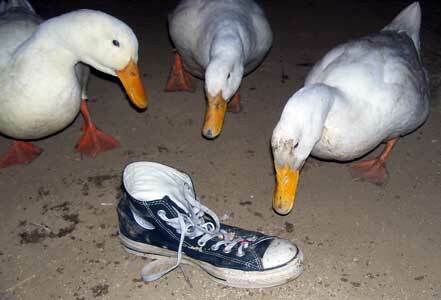 You may look upon others, and see their Converse shoes. It makes us feel like one, and it gives us all a certain bond, bringing humanity together. Converse shoes do that for us. They allow us to have adventure, but we will also have our sense of security with us forever. The story of my life is told in my Converse shoes. I spend a lot of my life traveling with my family and being out and about. Sometimes when you take two very ordinary things and put them together, they form something very unusual. A pair of Converse shoes and a person wearing them just forms something so idealistic and so nostalgic and yet all in present-day times. It’s so indescribable, really. Occasionally, we all find ourselves alone and forgotten. We may be driving in our car, aimlessly looking for a place to rest — a place to take us from this insecure world into happiness. It is only then when we will realize what we truly are looking for. The key to our past — that small reminder that we carry on for all of our life. For me, it is my Converse shoes. They take the burden of my load, and they scar and tatter and tear. I’ll be able to look back at these pictures several years down the road. I will look older, I’ll be wiser, and things in my life will change. I will still have a certain connection through those shoes. I will forever wear Converse, and I know that I will never outgrow them. It makes me feel so thankful to have something like these shoes. What memories go with these chucks? 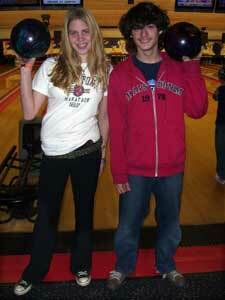 My friend Grant and I at the bowling alley. Split screen of Caylin and Briana. One thing that I have been doing practically ever since I could walk, is bowling. Bowling has been a big part of my life ever since I could remember. I also spend a lot of my leisure time on the computer writing and drawing. 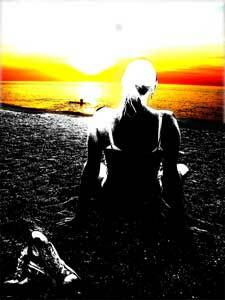 I enjoy writing of ordinary people in ordinary situations, and I like to draw people and animals and objects. My passion is for cartooning though, mostly. My comic characters are usually wearing Converse, actually. I think it makes me feel like I have a bond to my comic characters. With them wearing Converse, it’s like they come off of the paper and are real to me. I also talk to a good friend, Caylin, on the computer. She and I have been friends for five years, approximately. She has a pair of black hightop Converse, as well as a pair of the knee-high purple Converse too! 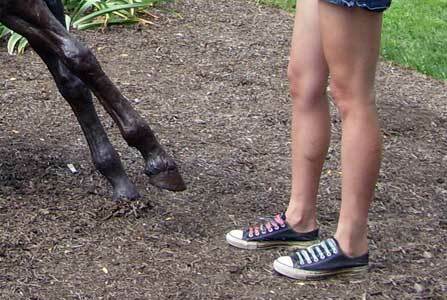 In the picture, she is wearing her purple knee-high chucks. You see, Caylin lives across the country, in Washington, so the only way to get a picture of us together- is by doing a split-screen! Ralphadelphus (left); Ralph, Daphne, and Lafayette check out Briana’s black high top. I live in a somewhat rural area, and we have a large yard and a barn. 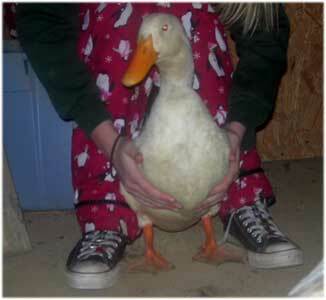 I have three pet ducks, named Ralphadelphus, Daphne, and Lafayette. Ralphadelphus whom I’ve had since he was two days old, is a really interesting duck, as he answers “yes” and “no” questions by quacking, and he knows to come to his name and also to “food”. The other two are not so bright, but I have not had them for long as they have been rescued. Of my six siblings, two of my brothers have Converse shoes. The oldest is Chris, and the other is Adam. Chris was the first in my family to get Converse, when he was about my age. He is eight years older then I am, and for a long part of my childhood he was the one I looked up to. Ever since he’d first gotten his Converse shoes, I, too, wanted a pair. In the picture above, Chris is the one to the left, Adam has the yellow flame Converse low tops, and one of my black high tops is on the right. Briana talking to her boy friend in the family pickup truck; Briana with her dog Mindy. I do not know who I am or who I will become. I know where I am and where I’ve come from. I suspect the rest of my life I will have a wandering spirit. Why do I wander? For pure enjoyment. The only difference from me to the other wandering spirits that roam this world, is that I am not looking for security. I have my security accompanying me. I have my happiness, and I am content. My Converse shoes are my life. Without them, I would most certainly be lost like everyone else.